You know when you get caught up in an issue that you can’t resolve. Your mind spins over and over again and you marinade in the drama until it’s practically suffocating. I become pretty immobile when I’m upset. I’m not one of those people that can pretend or… function when my mind is somewhere else. I just shut down. It’s the complete opposite of how I normally am. Normally, I am GO GO GO GO. So, whenever I get into one of these funks, my husband overcompensates to try to cheer me up. It’s always fun to watch (looking back). 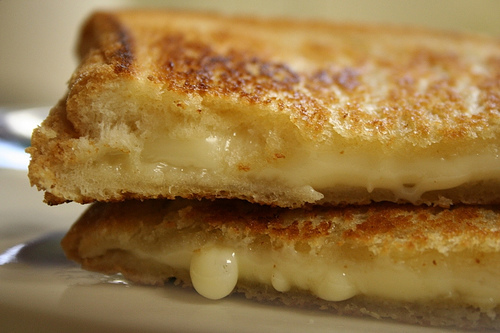 Yesterday, he made me a grilled cheese – something he had to do for me for 6 months straight during my first pregnancy. I used to have to take medicine at 3AM each morning to help stop contractions for many months and always needed to do it with food. Every morning, Bill would go downstairs and make me a sandwich. He hasn’t done that in at least 5 years and yesterday he was back at the stove and I thought that was the cutest thing. Anyway, he ended up going out with some friends last night to a planned event that he puts together once a month (my social butterfly) and I was left alone to dive deep into my frustrations once again. And I started to sink and sink and sink until a voice inside my head said, “just look”. And I saw pictures on my wall of my babies. I saw my dogs sleeping on my lap. I saw my living room with my television with ‘House’ on (one of my favorite shows). I saw a drawing on the table my girl made for me before she went to sleep that read “I love mommy”. I saw the plate my grilled cheese was on and in that instant it just all cleared up. Just look. Everything is alright. We are safe. We are loved. And even though things don’t always go as planned, in the grand scheme of things, it doesn’t really matter. So, next time you are in a funk – just look. Sending you a BIG virtual hug! Bill is definitely a keeper and you guys are very blessed to each other and two beautiful kids. Hope today is working out better for you :).